1. Preheat the oven to 190°C, gas mark 5. Pour the kirsch or pomegranate juice and 150ml water into an ovenproof dish, large enough to hold the plums in a single layer. Add the star anise to the liquid and sit the plums on top, cut-sides up. Sprinkle with 160g of the sugar and bake for about 20–25 minutes, until the plums soften but retain their shape. 2. Soak the gelatine in cold water for 5 minutes. Lift the plums onto a plate and pour the warm cooking liquid into a measuring jug. Discard the star anise. Make up to 500ml with boiling water if necessary. Add the squeezed-out gelatine leaves, stir to dissolve and set aside to cool completely. 3. To make the custard, pinch the marzipan into pieces and space out on a large baking sheet lined with baking parchment. Bake for 4–6 minutes, until melted and pale golden. Put the milk and toasted marzipan in a large saucepan and heat through. Remove just before it boils and leave to infuse for 20 minutes. Blend until smooth, then pass through a sieve and return to the pan. 4. Whisk the cornflour, remaining sugar and egg yolks in a bowl. Bring the milk back to scalding point and slowly pour onto the eggs, whisking. Return to the pan and bring to the boil, whisking. Simmer for 2 minutes until thick. Remove from the heat, stir in the vanilla extract, cover the surface with clingfilm and leave to cool. Whisk in 300ml double cream, cover and chill for up to 3 days. 5. To assemble the trifles, divide two-thirds of the ratafias between 8 glasses. Pour the cooled plum liquid over the biscuits and chill for 1 hour to set. Top with the plums, followed by the marzipan custard. Lightly whip the remaining 300ml cream with the extra kirsch, if using. Spoon on top of the custard layer. 6. Just before serving, scatter with the flaked almonds, pomegranate seeds and remaining, roughly crushed ratafias. For a spicier flavour, swap the star anise for a sachet of Waitrose Signature Spice Mulling Mixture. 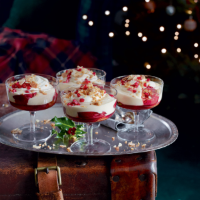 Make the trifles the night before to let the flavours develop.